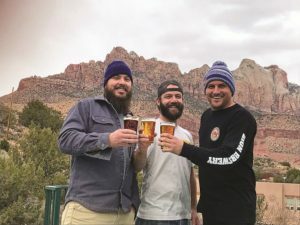 Zion Brewery’s original founders started operations in 2006, joining the surging craft beer movement. 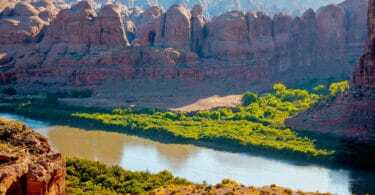 “Before then Southern Utah didn’t have a brewery,” explains Jeremy, who assumed his position in 2013. 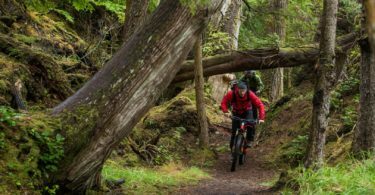 Having cut his teeth at Smuggler’s Brewpub in Telluride, Colorado, before moving to Utah, he ran Zion Brewery by himself, with guidance from manager Cris Pace, for a couple years before adding to the team. 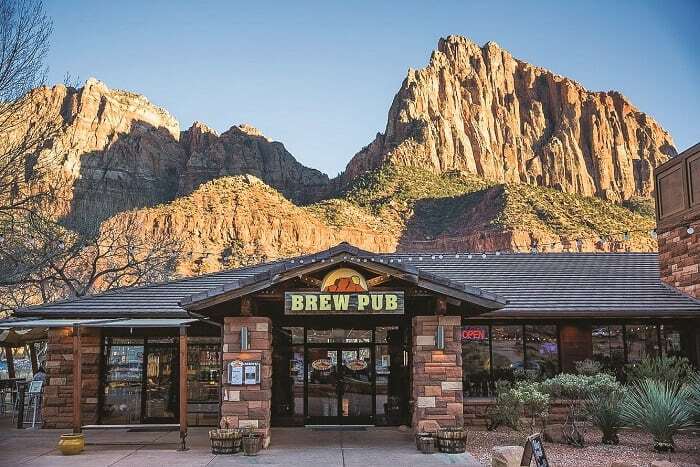 They are now four people strong, with Southern Utah native Jay Mecham as assistant brewer, and Frank Giammalva, who started as a server in the Brew Pub, as director of sales and distribution. The Brew Crew (left to right) Jeremy Baxter, Head Brewer, Jay Mecham, Assistant Brewer, Frank Giammalva, Sales and Distribution. Jeremy created all-new beer recipes for Zion Brewery, and his adventurous spirit shines through in flagship brew varieties such as Foray (a kettle-soured pomegranate ale) and Conviction Stout (made with locally roasted coffee). “We like to switch it up. Sometimes we do a prickly pear kettle-soured ale or a peach kettle-soured ale, depending on the season,” he says. With a new reverse osmosis system to help them create their desired water profile, he and Jay are excited to create lagers this year, after having been “ale-focused” for the past four years. Read more at UtahStories.com. And if spirits are more your thing, check out Getting High in the West.